Scientists have discovered a weird sharp-clawed bird-like dinosaur that roamed the Earth with the dreaded T-rex 66 million years ago and is being described as a “chicken from hell”. The beaked dinosaur, Anzu wyliei, was almost 5 feet tall at the hip, measured 11.5 feet long and weighed up to 300 kg and had very sharp claws. 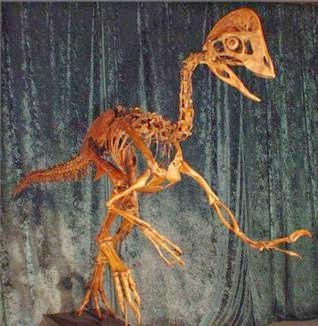 “It was a giant raptor, but with a chicken-like head and presumably feathers. The animal stood about 10 feet tall, so it would be scary as well as absurd to encounter,” said Emma Schachner from the University of Utah, a co-author of study. “We jokingly call this thing the ‘chicken from hell,’ and I think that’s pretty appropriate,” said Matt Lamanna of the Carnegie Museum of Natural History in Pittsburgh, the study’s lead author. Three partial skeletons of the dinosaur — almost making up a full skeleton — were excavated from the uppermost level of the Hell Creek rock formation in North and South Dakota — a formation known for abundant fossils of Tyrannosaurus rex and Triceratops. Anzu is also “one of the youngest oviraptorosaurs known, meaning it lived very close to the dinosaur extinction event” blamed on an asteroid striking Earth 65 million years ago, Schachner said. “Two of the specimens display evidence of pathology. One appears to have a broken and healed rib, and the other has evidence of some sort of trauma to a toe,” Schachner said. Like many “new” dinosaurs, Anzu wyliei fossils were discovered some years ago, and it took more time for researchers to study the fossils and write and publish a formal scientific description. The finding was published in the journal PLOS ONE.